We offer a wide range of Heating products and services to meet your every need. Please Contact Us to inquire about how we can improve your existing home with our quality products and services. We will keep you warm all winter long! The Inspector™ infrared video inspection camera allows our technicians to make sure that your furnace does not have any holes, cracks, rust or corrosion damage inside your furnace. By taking this step, which is at no additional cost to you, we can make sure that none of those nasty gas by-products are getting into your air supply. 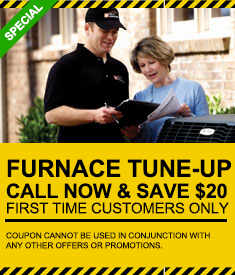 We do this to offer you “Peace of Mind” in knowing that your furnace is safe for you and your family. The Inspector™ infrared video inspection camera allows you to clearly see the holes, cracks, rust, or corrosion damage inside any furnace. It’s the world’s first and leading heat exchanger video inspection camera, with an infrared, high-resolution camera mounted on a 37-inch wand that is attached to its very own display monitor. Our technicians have been trained and are certified Professional Safety Technicians with this innovative technology. When our certified Professional Safety Technicians arrive in your home with the Inspector™, you can rest assured that your furnace will be fully inspected and certified safe for you and your family. Should our technician find something wrong, you can verify it for yourself. There is no need to take our word for it. We can even record these inspections so you can review them again if you need to. With this innovative technology, we have taken the guesswork out of it. 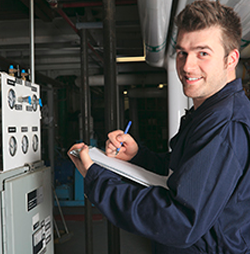 As a service to all of our customers, we include these “Peace of Mind” inspections with every tune-up and service call. You can relax, kick back and breathe easy with Shamrock Heating and Air Conditioning! 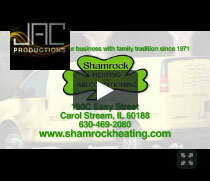 As your home-town industry-experts, Shamrock delivers the highest standard of home comfort with our world-class trained technicians, innovative heating and cooling solutions, and outstanding service and support that is available to you round-the-clock. Shamrock will meet all of your home’s unique comfort and indoor air-quality needs, regardless of your budget. 2019 SHAMROCK. ALL RIGHTS RESERVED.